Changing of the guard at Camera Etrusca. What were you doing back in 1990? It was quite a lively year: the USSR collapsed, Nelson Mandela was freed, the Hubble space telescope was launched, Kuwait was invaded then liberated, while a man in London was liberated too…..of his briefcase at knifepoint – and of bonds worth £292 million, Sinéad O’Connor made ‘Nothing Compares to You’, I started going out with my wife, and ……… …..my beloved old Land Rover Discovery was manufactured. I bought it second hand in 1996 and by April of this year it had a whopping 600,000 km on the clock……and it would do no more, the poor overworked beast just gave up – or rather my mechanic did. Ever so battered, scraped, scratched and that muddied I never washed it, on the outside, thinking it looked more scruffy clean than dirty, it was hauled off to the knacker’s. I had baptised it Hesperus after an illustrated 1950s children’s story book about a beaten up old jalopy I’d loved as a kid. 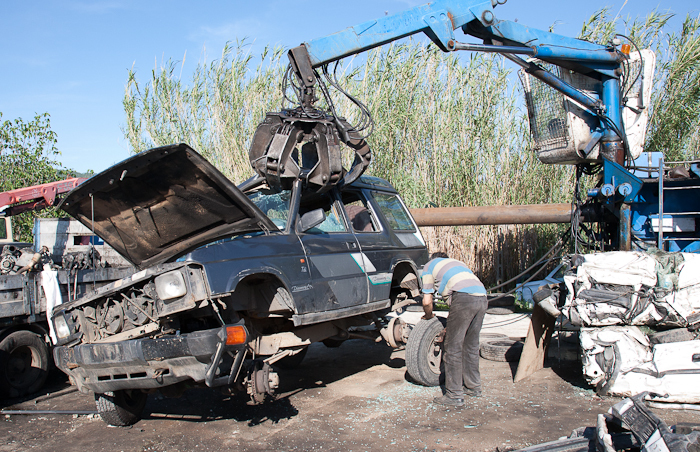 It has finally gone to a better place – namely the scrap yard at Bolsena. The next picture I post will be of a cube. Some things I won’t miss, the leaky skylights for instance. I have an abiding memory of my mother-in-law under an umbrella during a downpour in Sicily, inside the car. The new model doesn’t have skylights. I had customised it too. I stuck a rubber mat on the roof so I didn’t repeat a slip up during a snow-storm near Bologna when photographer and Noblex Pan camera went bouncing onto the ground doing neither of us any good. It really was the perfect photographer’s vehicle – so battered I had practically no compunction about taking it anywhere. This means that the documentary about Camera Etrusca photo workshops filmed last year in which Hesperus featured strongly, is now hopelessly out of date, thus we’ll be shooting another one this summer, probably of the mid-June photography workshop. So out with the old, in with the new: a 5 door, 5 cylinder Mk11 model with only 160,000 km – and very smart it is too. Everything works – something that I’m really not used to – I especially like the super efficient air conditioning system, so from now on Camera Etrusca courses will be cooler than ever. I don’t know that I’ll be going over the same rugged terrain that I did with faithful old Hesperus, the new model will be treated with respect… for the time being anyhow. As in the children’s book, Hesperus has been transformed into a shiny new(er) model.